Shortstop Masen Hibbeler (7) drove in three runs on a pair of RBI singles to lead the No. 12 Texas baseball team to a 4-3 win Sunday over No. 11 Texas Tech (photo courtesy of texassports.com). 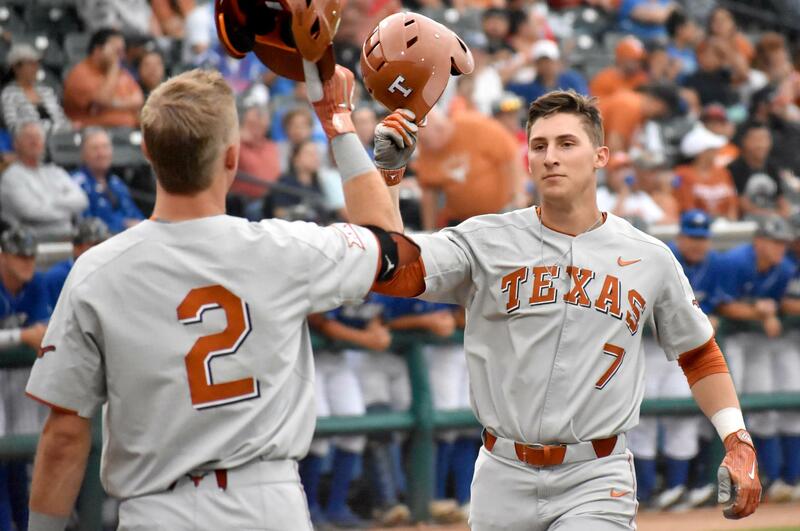 AUSTIN, Texas — If the Texas baseball season ends the way the Longhorns and their fans hope, this weekend might be a series that can be pinpointed as a crucial measuring stick in the team’s progress. Shortstop Masen Hibbeler smacked a two-run single in the sixth inning and drove in the game-winning run with another RBI single, and UT head coach David Pierce used an army of seven pitchers as the No. 12 Longhorns held off No. 11 Texas Tech, 4-3, in the rubber match of a three-game series with the Red Raiders at UFCU Disch-Falk Field. Texas won Friday’s series opener by the same 4-3 score and got shut out, 3-0, Saturday. Since losing three of four at Stanford, the Longhorns have won three of their last four, improving their season record to 15-7 overall and 2-1 in games against Big 12 opponents. Texas Tech slipped to 12-5 overall and 1-2 against Big 12 opposition. The Texas arms race was led by a pair of freshmen. Freshman Mason Bryant, the Longhorns’ fifth hurler of the day, got two outs in the sixth inning to pick up the first victory of his college career, while Kolby Kubicheck picked up his first career save. Pierce went to the parade of pitchers from the bullpen to the mound in order to arrange matchups against the Red Raiders, and the strategy worked. While UT pitchers allowed eight hits, they also managed to strand 12 Tech runners. The Longhorns’ pitching prowess was needed, as the Texas offense stumbled out of the gate, failing to muster a hit through the first five innings, after which the Red Raiders enjoyed a 1-0 lead. But UT grabbed the lead for the first time in the sixth inning when right fielder Austin Todd knocked a single up the middle and advanced on a bunt single by left fielder Eric Kennedy; both runners scored on Hibbeler’s subsequent single. After Hibbeler and first baseman Tate Shaw pulled off a double steal, the throw home got away from Tech catcher Braxton Fulford, allowing Hibbeler to race home with UT’s third run. Texas got the eventual running run in the eighth inning, when designated hitter Zach Zubia walked, and pinch runner Bryce Reagan took second on a wild pitch and scored on Hibbeler’s second RBI single. Tech scored a pair of runs in the ninth inning before Kubicheck closed out the game, striking out one and allowing no hits in his inning of work. The Longhorns will host a pair of games this week when Arkansas comes to UFCU Disch-Falk Field for games Tuesday and Wednesday, each of which will start at 6:30 p.m.